Tagline: He’s just CRAZY bout this store! By the turn of the 90s, the censorship boards at the BBFC and MPAA had all but slayed the slasher movie. Back in the early 1980s, the ‘video nasties‘ scandal would trigger a moral outrage, a diet of shock politics and tabloid sensationalism striking fear into the population, leading to the once explicit sub-genre’s descent into mediocrity. Many tricks and gimmicks would succeed in stretching its lifespan, and no more so than in the Friday the 13th series, which would rely on 3-D, false promises, impostor killers, Carrie clones, and iconic (if barely seen) locations to keep the lolly rolling in, all of it tied to a new tongue-in-cheek meta approach that would somehow make a protagonist out of the inimitable masked killer. As Jason Voorhees took a long, laborious boat ride for what would prove to be his most bloodless killing spree, the once gore-hungry slasher threatened to disappear down Norman Bates’ plughole, but some were unperturbed by the censorship frenzy, particularly a debut feature director by the name of Scott Spiegel, who would let rip with a supermarket-based splatterfest of ingeniously graphic proportions. Giant earrings may have been all the rage, but giant nose rings would prove hazardous. Thanks to those God-fearing bastards controlling the censorship guillotine, fans would not get to see the extent of Intruder‘s unabashed splatter until many years later, and the fact that almost five minutes was nixed from the original cut tells you all you need to know about the graphic nature of its content. So extreme and convincing were its practical effects that one scene in particular was cut in its entirety, and for those of you who have seen this slice of grue-packed goodness, you’ll know exactly which scene I am referring to. Although Intruder was Spiegel’s first foray as a feature director, he arrived with some pedigree having co-penned the screenplay for Sam Raimi’s Dead by Dawn, a quasi-sequel with the exact same premise as the director’s 1981 classic The Evil Dead. One of 72 movies banned by the BBFC, Raimi was forced to remake his low-budget baby as a horror comedy in order to sidestep the censors. In many ways the movie was just as gruesome, but the insidious nature of its predecessor had been replaced by a smash-mouth slapstick approach, one that proved self-censoring by making the horror more palatable. Intruder takes more than a leaf out of Dead by Dawn‘s Book of the Dead, presumably in the hope that Spiegel and co. could get the majority of its carnage through the censorship door, and there are many comparisons to be drawn here other than the obvious cameo of cult figure Bruce Campbell. First of all, the movie has its tongue firmly in its cheek. The murders may be gruesome, devastatingly so, but like Dead by Dawn its sense of fun and Days of Our Lives characterisation softens the blow, while a ludicrously comical killer only adds to the film’s absurd presentation. Root canal techniques have come a long way since the late 1980s. The plot is extremely and effectively simple: on the eve of a corporate takeover, the employees of a local supermarket are plunged into joblessness by conflicting co-owners, and when a checkout girl’s jailbird ex-boyfriend comes a knocking, everyone there has a reason to feel aggrieved, and the movie quickly becomes a by-the-numbers whodunit that will perhaps keep you in the dark due to how peripheral it is to the overall movie. Although, if you’re distracted enough from the action to have a stab at the killer’s identity, you will likely drown in the proverbial blood of the blatantly obvious. Like Dead by Dawn, Intruder is also technically playful, although sometimes to its detriment. While the former used bizarre angles to represent Ash’s claustrophobia and descent into madness, Spiegel uses similar techniques for seemingly no reason at all, filming redundant interactions from dizzying angles which make absolutely no sense, and only serve to baffle the viewer on a technical level. While Dead by Dawn utilised anonymous POV shots to convey the existence of ethereal spirits, Spiegel shoots from inside a moving shopping cart simply for the hell of it. Little did she know that the killer was hiding inside the telephone. That being the case, there are some inspired examples of this kind of carefree creativity⸺an ingenious shot of our murderer’s blurred reflection being one of them⸺while a bloodied light bulb motif, again borrowed from Raimi’s The Evil Dead, is particularly effective – perhaps even more so than its source material. The movie also borrows heavily from John Carpenter’s Halloween as our POV killer stalks with a perverted breath, and a series of seemingly innocuous shots hint at the presence of an unseen menace. It is because of this that the movie is able to muster instances of palpable tension. In the end, Intruder is all about a series of murders and their creative extremities. This is the kind of picture that relishes in its ability to make its audience cringe, and thanks to the special effects maestros at KNB EFX Group, who went on to work on cringing classics such as Misery and From Dusk Till Dawn, you find yourself anticipating each kill with a worrying fascination, wondering what on Earth they’ll come up with to top the last. Tom Savini would be proud. There are so many to choose from, a paper spike through the eyeball and a head squashed in a garbage compressor proving two of the most unsettling, but for pure cringing terror nothing beats one unlucky customer’s date with a bandsaw. Cripes! Intruder offers its fair share of visual jokes in its attempts to counterbalance the gore, but that of our resident killer beating red herring Craig with the severed head of a previous victim probably pips it for plain absurdity. After being fingered as the unlikely culprit, our killer goes some way to explaining his psychopathic psyche. Killer: Don’t you see? I’m just CRAZY about this store! 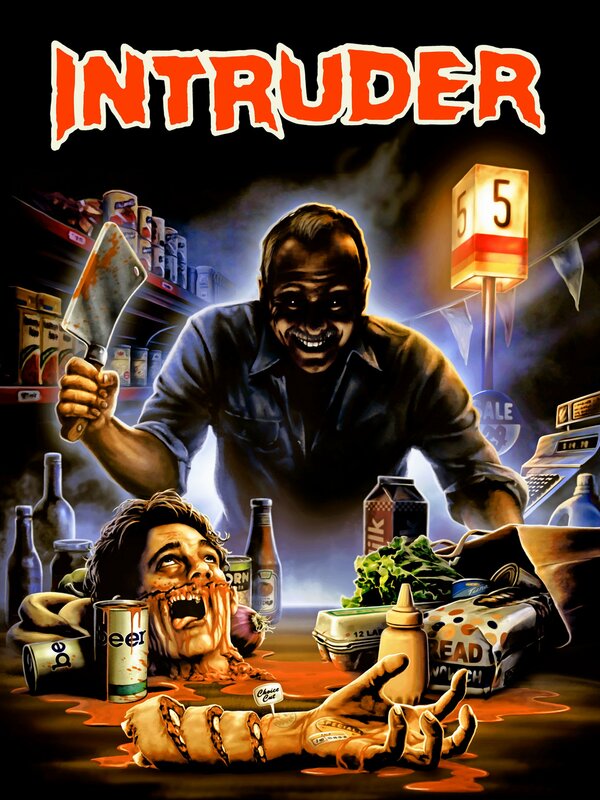 Intruder is a technically proficient textbook slasher elevated by a series of quite astonishing kills and a whimsical tone which prevents it from descending into the kind of cynical, perverted trash that once plunged the sub-genre into commercial purgatory.